On a Friday night a few weeks ago, five friends and I put on some makeup (for a change), kissed our husbands and babies goodnight and went out for a relaxing and enjoyable girls night dinner. With wine! Although we’ve gotten together almost every week for the past year it was actually the first time we’d met up without the kiddies. I can’t believe we didn’t think of doing this sooner – it was so nice to finally sit down and catch up in relative peace. When it came time to order, all six of us each ordered steak. One friend and I had the steak frites (because I find it impossible to bypass menu items that come with fries) while the rest ordered steak salads. I definitely felt a tinge of guilt over this. But not enough to change my order. Our food came out and I was very pleased with my choice – the New York strip was cooked nice and medium-rare, just how I like it. And you know those salad girls all picked at my fries! But I had to admit, something inside me secretly wished I could have displayed a little bit more willpower to resist the fries and enjoy the healthier salad instead. 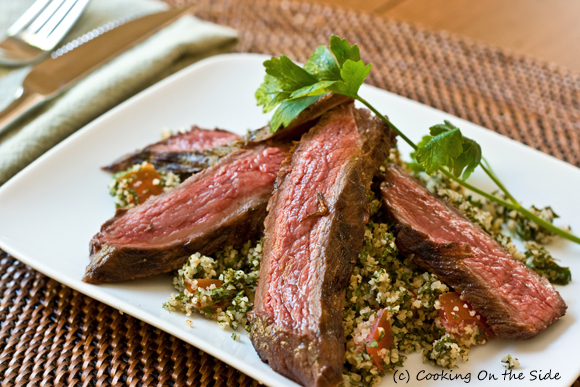 So when I found this recipe for a Grilled Steak Tabbouleh Salad on a package of beef this week I thought I might redeem myself a little. Aside from the overnight marinade it was a relatively quick, flavorful dish to put together. 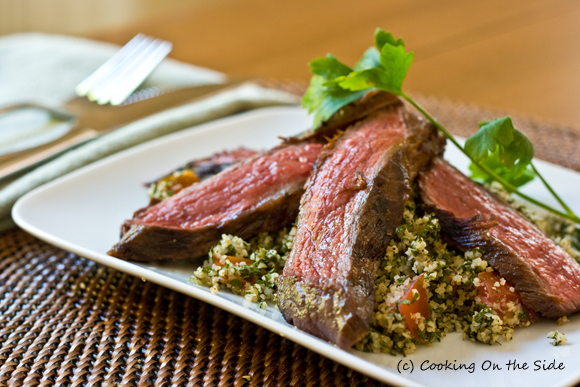 I was enticed by the fact that the steak would be set atop fresh and zesty tabbouleh, rather than greens, as it seemed a bit more substantial than some other salads. I’m proud to say I got to enjoy my steak and didn’t miss the fries one bit. Combine lemon juice, oil and parsley in a small bowl. Cover and refrigerate 1/3 cup for tabbouleh. Place beef steak and remaining lemon juice mixture in food-safe plastic bag; turn steak to coat. Close bag securely and marinate in refrigerator 6 hours or as long as overnight, turning occasionally. Up to 1 hour before serving, hydrate tabbouleh mix with boiling water according to package directions, omitting any oil. (Do not proceed with package directions beyond this point). Add tomato and 1/3 cup reserved marinade to hydrated tabbouleh; stir to combine. Set aside. Carve steak into thin slices; season with salt and pepper, as desired. Serve over tabbouleh. Hi there! I found your blog through another and found out, from reading your About Me, that you live in San Diego, too! I haven’t found many so I always get pretty excited whenever I find a fellow San Diegan. Anyways, all of your recipes and photos look incredible! Always great to find out about other San Diego bloggers! There are actually quite a few of us, as I’m slowly discovering. So nice to meet you! I usually go for the fries too. But, I order a salad and fries as a side. My coworkers always laugh at me, but then they sneak bites of my fries…just order fries, people! 😉 Tabbouleh is one of my favorite salads, though, so if I were to give up fries for a salad, it would be this one. Looks gorgeous! I can’t resist fries on a menu either, but wow this salad is pretty amazing. Sheesh, you’ve been busy girl! Everyone needs Girl’s Night Out without the kiddies. You should do that more often. Love the simplicity of this. I’d totally make this for lunch for myself! What a fabulous meal! That steak looks perfectly cooked! This looks incredible! Definitely going to make it. What a great idea for a blog…I’m subscribing.